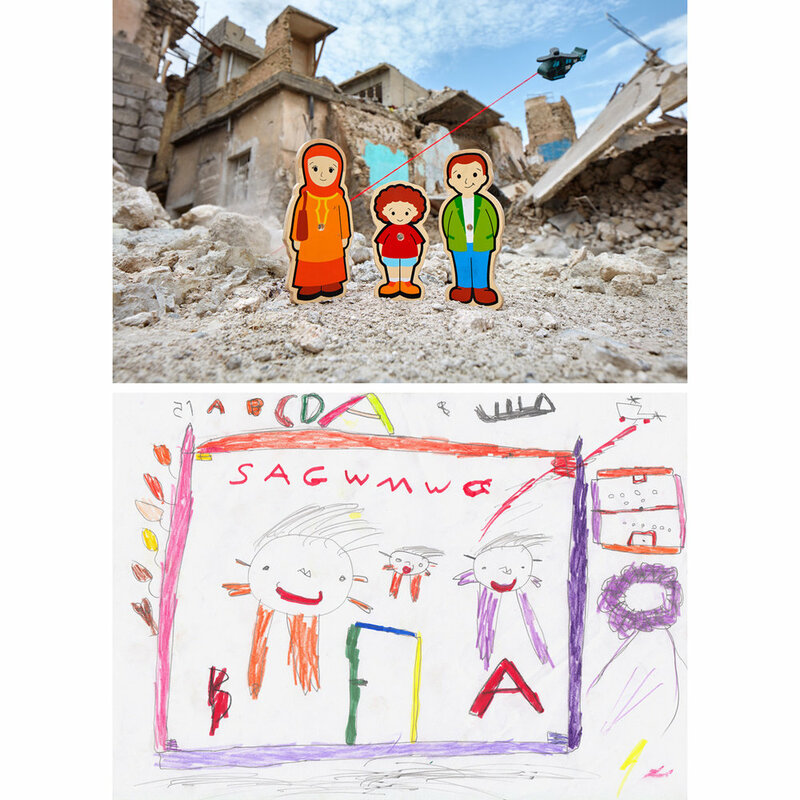 At a child friendly space in the Debaga IDP Camp in Iraq, Hussein made a drawing showing he and his parents returning home, yet even at this hopeful event, a helicopter can be seen shooting at them from above. As he waited to show the art therapist his drawing, Hussein filled the blank spaces on his page by practicing the English letters he had been learning. A set of secondhand wooden toys were found in a bin at the Langa Bazaar in Erbil. The figures looked like they once belonged to a puzzle for a young child, one where each family member had a place where they fit, perhaps within a house. They were taken to the remains of the Old City in West Mosul, and Hussein’s imagined homecoming was photographed within the current reality, still littered with corpses and explosive hazards. In an art based interview with Myra Saad, a young Iraqi girl named Noor made a drawing about her father guiding her across a bridge that had been destroyed. Someone had used a piece of wood to span a broken section, and she was scared to cross it. Despite the peril, getting to the other side was the only way to reach the relative safety of her uncle’s house, away from the fighting. Soon after, she and her family had to flee again and ended up at the Debaga IDP Camp southeast of Mosul. Ahmad made a drawing he labeled as “a huge elephant and its [family] members” during an art-based interview with Myra Saad inside the Debaga IDP camp in Iraq. When Myra spoke with him about it, she asked about the one elephant that only had an outline. He said very intently that he didn’t want to color that one in. It was the ghost of a dead sibling, gone but still felt. The toy elephants were photographed in Mosul at the base of the al-Hadba’ ("hunchback”) Minaret, built in the 12th century and destroyed by ISIS in 2017 in the final days of the battle for the city. “When people started fleeing, my mom told my sister and me to go get the rest of the family. We went out of our street and there was an Islamic State fighter lying there. His stomach was detached and his arms were dismembered next to him.” (translated from a Reuters interview with Saja Ibrahim on 8 July 2018 at a TdH Italia CFS in Debaga, Iraq). 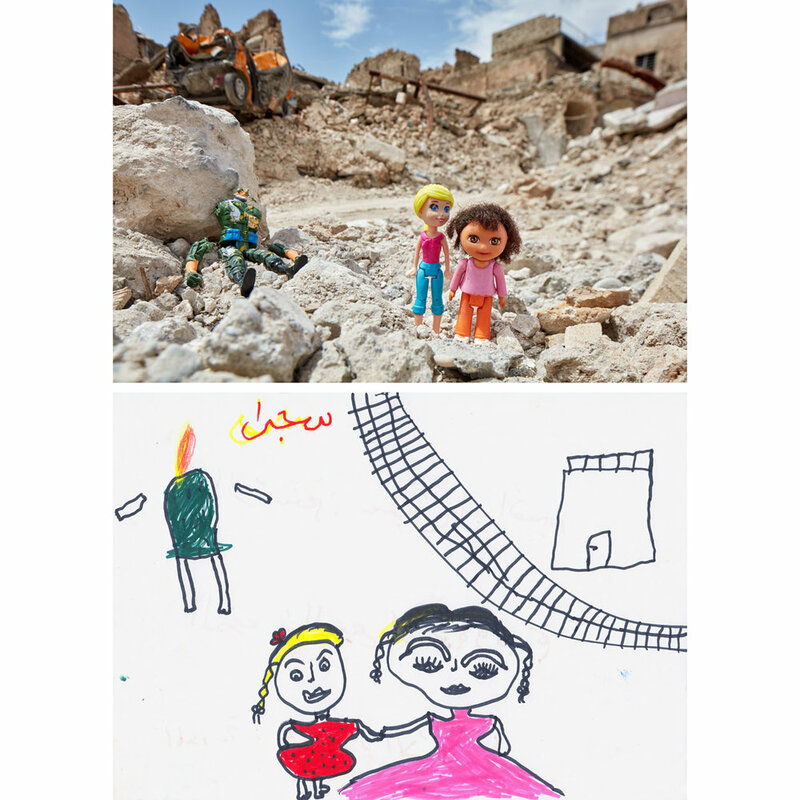 Saja shared her story in an art-based interview conducted by Myra Saad in May 2018 at the Debaga IDP Camp in Iraq. The toys were a combination of secondhand dolls found in the Langa Bazaar in Erbil and a new action figure, bought in the Central Bazaar then modified. As the photo was shot in Mosul’s Old City, crews of young men were sifting through the rubble, pulling out scrap metal and unearthing the bodies of fighters and civilians that remained.